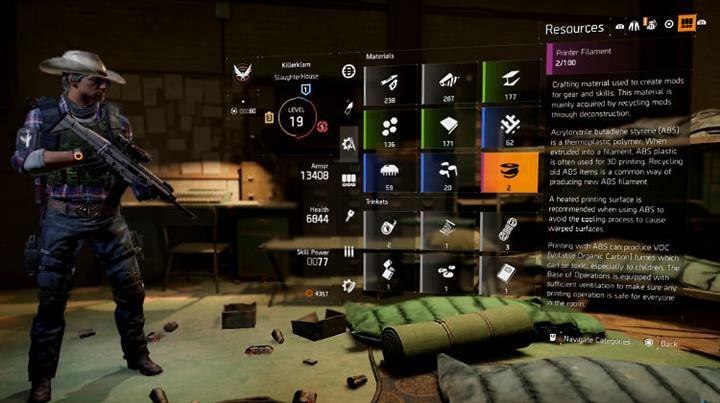 The Division - Gear Set Bonuses and Talents - Which Set is Best? Massive have now confirmed the Gear Set bonuses and exclusive Talents that come from the four new Gear Sets: Striker's Battlegear, Path of the Nomad, Tactician's Authority and Sentry's Call. Needless to say these Gear Sets have incredible bonuses and some of the Talents are so insane that it's going to become mandatory to have them from now on. Set bonus (2): +20% enemy armor damage. Set bonus (3): +100% critical hit damage. 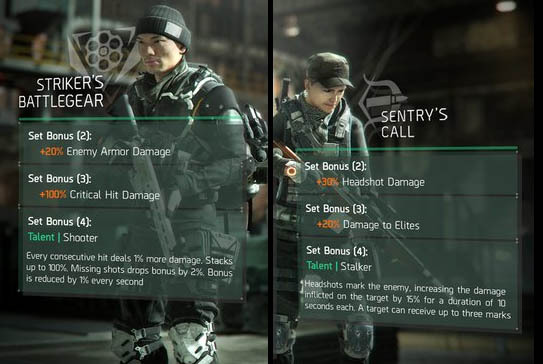 Set bonus (4): Talent: Shooter (every consecutive hit deals 1% more enemy damage. Stacks up to 100%. Missing shots drops bonus by 2% Bonus is reduced by 1% every second. Set bonus (2): +50% scavenging. Set bonus (4): Talent: Nomad: When receiving fatal damage, you are instead healed to full health. Can occur once every 10 minutes. Set bonus (2): +4000 skillpower. Set bonus (4): Talent: Tactician's Authority: Every 60k damage your group deals adds 1% skillpower to you for a max of 100% bonus. Bonus is reduced by 1% every second the group isn't dealing damage. Set bonus (2): +30% headshot damage. Set bonus (4): Talent: Stalker: Headshots mark the enemy, increasing the damage inflicted on the target by 15% for duration of 10 seconds each. A target can receive up to three marks. How do Gear Sets work? To put it simply Gear Sets are like a collection of related gear that when grouped together (equipped) will provide extra bonuses. The more of the same set you wear the greater the rewards but there is no point wearing more than four of the same set unless you're just after aesthetics. Another important point about sets is that wearing a single piece gives you absolutely no benefit - pieces from the same set must be used in Tandem. To get the highest and arguably the best bonus (i.e. the Talent) you MUST wear four pieces from the same set. Given the random nature of drops it's going to be a rare occurrence to see someone with four pieces from the same set since you can easily get the same piece many times or one piece from each set which equates to totally useless. The drop rate for Gear Sets is also fairly low so it's going to take a good deal of gameplay to rack up your perfect gear selection for the bonuses you really want. 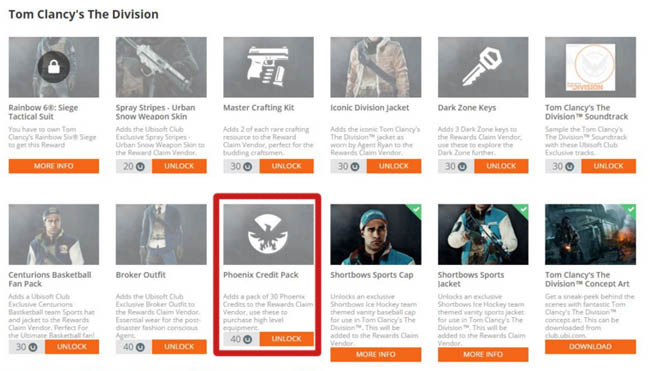 As you can see from the list above, each of sets offers rewards that far exceed regular gear in the game. At a first glance the Striker set is the best, thanks to its Talent called Shooter which gives you a 1% bonus for every consecutive hit. Imagine combining that with an SMG that rapidly lands hits on a high level boss. The total bonus stacks up to 100% meaning double damage if you're accurate enough. In the DZ that's going to obliterate. The Path of the Nomad is a close second - imagine nearly being killed only to come back to life again. Kind of like a second life or a 1up. Sadly this great Talent is kinda let down by the weak Scavenging bonus though. Of the four sets I would say that Tactician's Authority looks the weaker of the collection. I'm not convinced that 4000 skill power for a stat that is easily capped is worthwhile. The Talent is also kinda lame because it would only come into effect deep into a fight when things could almost be over. Since you can equip six pieces altogether a good balance between the four collections would be 4 x Striker and 2 x Sentry's Call. That would give you the insane damage boost from Striker and the Headshot and Elite damage from Sentry - a great combo! !